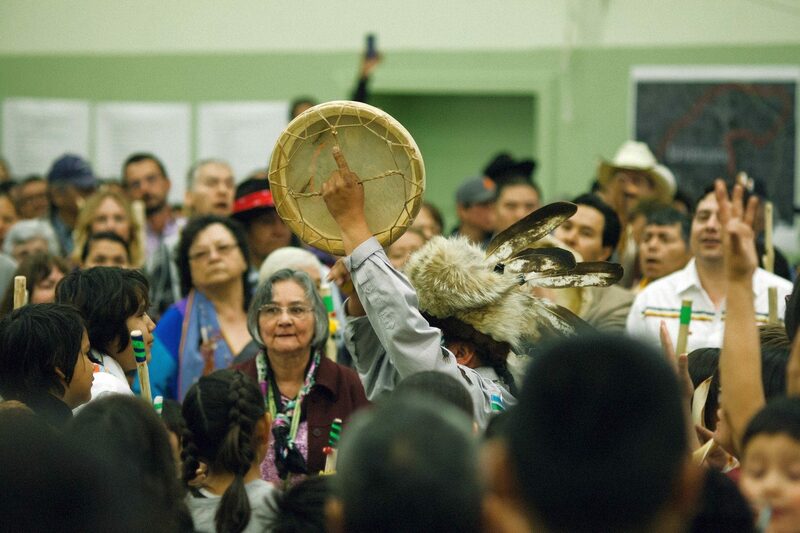 On May 8, 2017, the Esk’etemc of the Secwepemc Nation declared title and rights over the traditional territory of Esk’etemculucw. It was a day of celebration and ceremony. The community had voted to step away from the BC treaty process in March 2016. (The treaty process had been ongoing since December 1993.) In the time leading up to the vote, numerous meetings were held to engage the community and hear about what the community wanted to see. Elders were consistent in their attendance, speaking openly and passionately about Secwepemc history, traditions and beliefs. This gave the rest of the community an opportunity to understand the value of the Esk'etemc way of life and it's traditions. Since then, aspects of the Esk'etemc traditional governance system were reinstated. The Kye7e's/women's group - mothers and grandmothers of the community - appointed Hereditary Chiefs and Headmen. Family Representatives were chosen by their families to act as liaisons to communicate within a traditional council, and to assist in larger issues that would affect the community as a whole. Those who were appointed signed the Esk'etemc Declaration of Title & Rights alongside elected (INAC) Chief and Council, declaring and solidifying our title and rights over our traditional lands, waters and resources. This process of implementing Secwepemc laws will strengthen our ability to protect our language and culture. This has given the Esk'etemc a sense of hope for future generations. Since May 8, 2017, Esk'etemc has released a Photobook (Celebration & Ceremony) and a Documentary Film (Ctsenmewsctem re Stsmemelt). Wellenwi7kt, re s7esk’etemc te Secwepemc re senxeteqs te qelmucw ne Esk’etemculúcw. Re s7esk’etemc tskwenstes re xwexweyte to stem ne Esk’etemculúcw. Ta7k tsk’wen te Kupementk stq’ey’s es kencitels te stsenq’yel’k’s re tmicwkt ell re ctk’wenm7iple7tenkt. Re s7esk’etemc ri7 Kupkukpi7 ell nek’westutmens re stk’ wenm7iplem’es elksentsuts. M ta7k skllekstmentem es kecmentem re stsenq’yel’k’s re tmicw, re sewllkwe ell xwexweyt re stem ne Esk’etemculúcw, ell re stk’wenm7iple7kt ne tmicw. Re Tqeltkukpi7 kectels te stk’wenm7iple7tem es yucwemintem, es 7elksentem ell es lecekstmentem re tmicw, re sewllkwe ell xwexweyt to stem ne Esk’etemculúcw ne Qelmucw ey te st’7ek. Te stsutkt ri7 le q7eses te stkwenm7iple7 te skukpi7stem, te smelcetwecw ell te qemqemt te sw7ec, yiri7 re stkwenm7iple7s re tmicw. Re stkwenmi7iple7kt ts7elkstem re m plek’wstsillnet ell tsyucweminstem xwexweyt re stem, re xqweltenkt, ell re ckwnemtenkt. Ri7 me7 t’ekstem tek me7 elksentem re tsq’ey’ te tsuwets ne Esk’etemculúcw ell ne sw7ecstwecwes, re ck’ultenkt, re qelmucw ey te st’7ek ell xwexweyts re wumec. Re United Nations Declaration ne stsq’ey’s re senxeteqs te qelmucw ni7 re we7eys re qelmucw te xeteqs te pellckul’ten ell re S7esk’etemc tsut me7 tskwenstes re stk’wenm7iple7 te xeteqs ell te sc7encwtsin ne Esk’etemculúcw. Ste’mi k kenem ne Esk’etemculúcw tsq’ey’e sulltimcs tek xeteqs ell e c7encwtsinkt ell me7 xyemcitels te stk’wenm7iple7kt. Yiri7 te Kukpi7stem me7 Kulentmes k qellqellt ell sletwilc tek sw7ec. Re S7esk’etemc set’ex ey te st7ek t’he7e te ctsenm7ew’sctels re Tqeltkukpi7, re ck’ul’tenkt ell e kitsentwecwes re k’wselkten ell xwexweyt te Kukpi7stes re tkwenm7iple7kt e yegwentem ell es melcitem re ckwnem’tenkt, re tk’wenm7iple7tenkt ell re necetenminkt ne Esk’etemculúcw es Knucweksen’s re tsutsllke7 te qelmucw ey te st7ek ell te swumec, sweti7 k te k’ulens re tmicwkt e cyesten’s. We, the Esk’etemc, of the Secwepemc Nation are the Original people of Esk’etemcúlucw. Esk’etemc hold collective title and rights to Esk’etemculúcw, no elected governments have authority to infringe our title lands or on our communal rights. As a sovereign and self-governing People, Esk’etemc declares our right to self-determination. We have never ceded, surrendered or given up our sovereign title and rights over the lands, waters and resources within Esk’etemcúlucw, nor the exercise of our laws on the lands. Our rights and responsibilities are laws, which were given to us by the Tkel Kukpi7 to protect, maintain and enhance the lands, waters and resources within Esk’etemcúlucw for future generations. We declare our ancient laws of respect, reciprocity, and balance, to be the law of the land. Our laws are exercised through our harvesting and stewardship practices, through our language, and through our ceremonies. We will continue to exercise our rights and responsibilities within Esk’etemcúlucw, and in relation to one another, our ancestors, those generations not yet born, and all living things. The United Nations Declaration on the Rights of Indigenous Peoples reflects fundamental human rights of Peoples, and Esk’etemc declares and upholds the principle of free, prior and informed consent applies to our Esk’etemcúlucw. Developments taking place within Esk’etemcúlucw requires our free, prior and informed consent, and must respect our laws. This is respect which will build positive, healthy and healing relationships. Esk’etemc looks forward to a reconciled future where, with guidance from the Tkel Kukpi7, our ancestors, and through the unity of our kw’selkwtn (relatives) and all respect for our laws, we can strengthen and share our culture, our governance, and our stewardship within Esk’etemcúlcw for the benefit of 7 generations of all Peoples and life, who make our lands their home.